Vintage Inspired Collage Art for Animal Lovers! Announcement Vintage Inspired Collage Art for Animal Lovers by Gianna Pergamo. Pergamo Paper Goods is run by Gianna Pergamo out of St. Petersburg, FL. Gianna creates all of her illustrations using acrylic paint and collage techniques. The signed prints, the cards, stickers, magnets, etc, are high quality reproductions of these handmade pieces. We use eco-friendly materials whenever possible. Currently, all cards are printed on FSC certified paper, our envelopes are 100% recycled, and the clear sleeves we package our cards in are biodegradable. We also make an effort to use eco-friendly shipping supplies, and pad anything breakable in clean re-used materials. 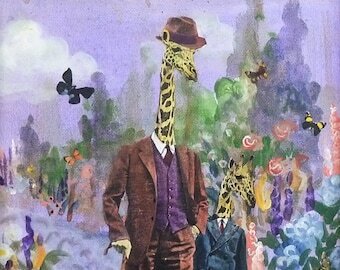 Vintage Inspired Collage Art for Animal Lovers by Gianna Pergamo. OMG!!!! I have a lot of fun, funky, great earrings. These are now my favorite! I got 3 pairs and I don’t know which one I want to wear first! Thank you so much for the beautiful earrings. Truly the best! My friend wore them the following day she received them and besides loving them, she said she received so many compliments on them. Thank you! My mom received them today and LOVES them! Great quality and awesome design! Mermaid Cat Earrings in the wild! 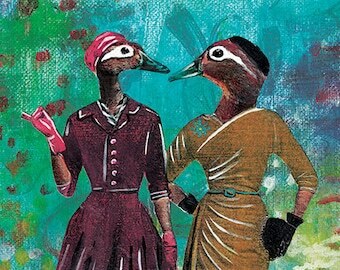 Lady Ducks art print just added to the shop! Gianna with one of her paintings, Alligator Ladies. Mixed Media on Canvas, 2017. Cards for any occasion, or no occasion at all :) Original illustrations, high quality cardstock. $5 each. 8x10" signed prints, $15 each. Every print is a high quality reproduction of an original piece by Gianna Pergamo. Vintage Inspired Art for Animal Lovers by Gianna Pergamo. Eco-friendly, family friendly, gay friendly. 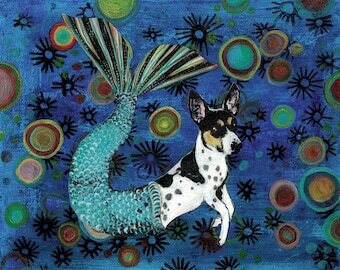 Pergamo Paper Goods is home to Gianna Pergamo's mixed media animal art. Gianna creates her unique pieces by hand (not on the computer!) and offers the originals as well as high quality reproductions and gift items. Her images are fanciful and humorous, and are inspired by vintage advertisements and textiles. These painting-collages are usually made on canvas and incorporate original acrylic painting, photocopied images, drawing with pen, pencil, and marker, and gel transfers of patterns. 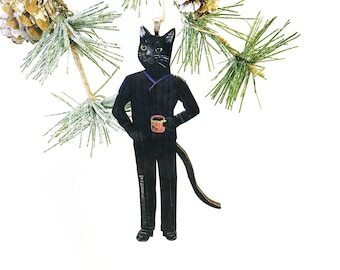 Founded in Providence, RI in 2012, Pergamo Paper Goods is now run out of St. Petersburg, FL. We use eco-friendly materials whenever possible. Currently, all cards are printed on FSC certified paper, our envelopes are 100% recycled, and the clear sleeves with which we package our individual cards and stationery sets are biodegradable. Also, all products are made in the USA! Additionally, we make an effort to use eco-friendly packaging, and pad anything breakable in clean re-used materials. You may have noticed Sophie the beauty pug in many of my pieces, Scout is a newer hire so she isn't in as many yet. Other responsibilities include: motivation management, guarding the inventory, sitting on my work, and snuggling. My printer does high quality work with a quick turn around time and friendly customer service. They use FSC certified cardstock for my items. Yes, it is possible to see your pet in a painting! Send Gianna an etsy convo to get more information. Custom pieces start at $200.